Have you ever had an experience that changed your life? If you have, then you know powerful that can be, whether through travel, meeting someone inspirational in your life, or any other kinds of instances. Or maybe it's more than one experience, rather a culmination of experiences that have totally made you turn your life in a different direction than what you had always thought. Francoise Decatrel had this kind experience when visiting Kyoto's famous geisha disctrict in Gion, Japan. While traveling there, she had the opportunity to bathe in an Onsen and experience traditional Japanese bathing rituals. Being introduced to Japanese bathing rituals changed Francoise's life and inspired her to create Amayori Rituals. These rituals rely on cleansing as an activity before entering the bath, afterwards allowing yourself a full relaxation immersion by soaking in the hot spring water. There is a concentration on taking the time for every aspect, not being influenced by the rush that society puts on us, allowing you to truly enjoy every moment from start to finish. Amayori Rituals as a name resurfaces Francoise's memory of a romantic evening stroll on a misty and quiet Sunday in Akasaka, Tokyo. Along with her long time passion of aromatherapy and Japanese skincare ingredients, Francoise sought out to establish a luxury bath, body care, and aromatherapy line inspired by Japanese bathing rituals. Amayori Rituals combines traditional Japanese bathing rituals with the comfort of being in your own home. With luxurious aromatic and beautiful botanicals and oils infused in their products, they create a deep relaxation and sensory experience. These products help to meditate and calm the mind, reaching a point of absolute serenity of your body and soul. Each aromatherapy fragrance blend is inspired by a specific treatment, ranging in concentration on stress relief, rejuvenation, relaxation, or even to help sleeping problems. They each set a scene to truly immerse yourself in. These natural, botanical aromatherapy fragrances not only provide a beautiful scent but directly affect the energies within us. 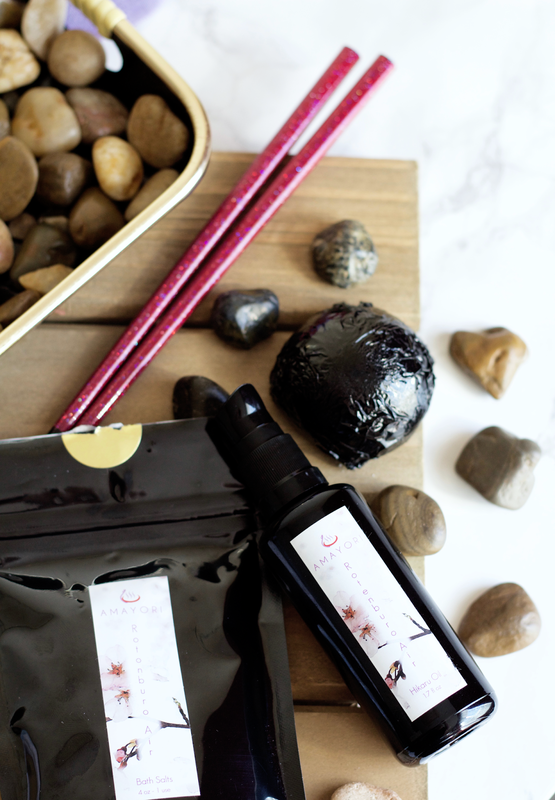 Some of her favorite ingredients to use are camellia seed oil, rice bran, sea kelp, sake, yuzu, and hinoki. Francoise makes these products in small batches, assuring excellent quality and precision. I have been acquainted with Amayori Rituals before this as Francoise had kindly sent me some products from her summer limited edition Okinawa collection and permanent line. 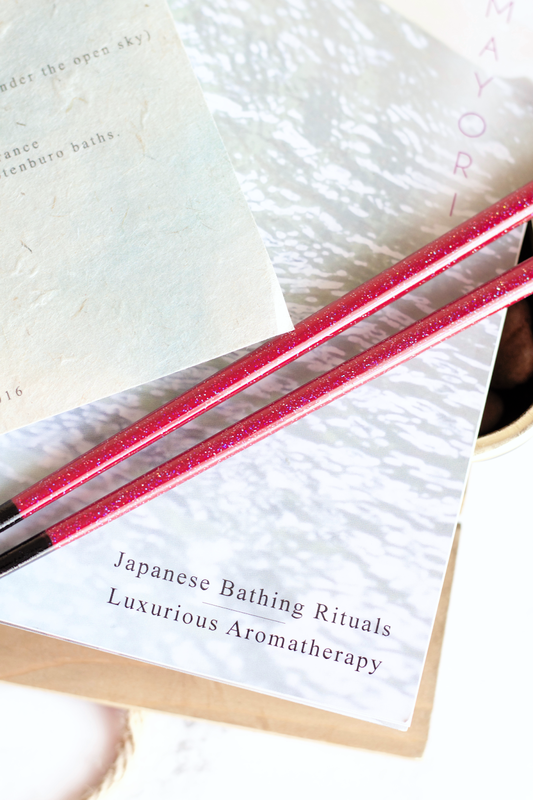 The Okinawa Aromatherapy Perfume Oil and Dreams of Gion Shower Mochi made me fall in love with her brand. I still even now use the perfume oil daily as it has one of the most beautiful fragrances. Onsen (温泉) are hot springs in Japan, offering the most beautiful outdoor scenery experience and relaxation. There are also indoor Onsens, but there's nothing like being surrounded by the natural beauty of Japan's outdoors. Onsen water has varying kinds of mineral content, each with their own health benefits. It's able to stimulate the metabolism and provide relaxation from the water pressure and buoyancy, along with having many other benefits. Not only is it a relaxing and therapeutic experience but you also can get some great treatments from it, such as helping back pain, rheumatism, poor circulation, high blood pressure, etc. Hence why often times those who have been suffering from ailments will visit an Onsen for treatment and prevention. There has also been dermatologist studies on the positive outcomes of Onsen bathing, such as helping psoriasis and atopic dermatitis. The term 'Toji' (湯治) means 'hot spring cure,' relating to the culture of Onsen being used as treatment for restoring your health (known as balneotherapy in English). There are some specific ways that you can truly get the most out of your hot spring experience, some examples you can find here. The Onsen water also ranges in different coloring and opacity, depending on numerous factors such as dissolved minerals, temperature, and so on. Onsens will normally be connected with ryokans, traditional Japanese inns, or available to use at public bath houses (known as "sento"/銭湯); hotels may have them available as well. There were numerous bath houses and well-known Onsens near where I was in the Tottori Prefecture in Japan, especially as the volcanic Mt. Daisen was in my near vicinity. Bathing is such an important activity, not only for cleansing purposes, but also as an individual time for ourselves to nurture and nourish. As Amayori Rituals was created to live a calm, fulfilled, and balanced life, taking the time for activities such as bathing can help to be in complimentary to those values. I think we all would like to have more calm and balance in our lives, especially for those of us who are always on the go and so stressed. 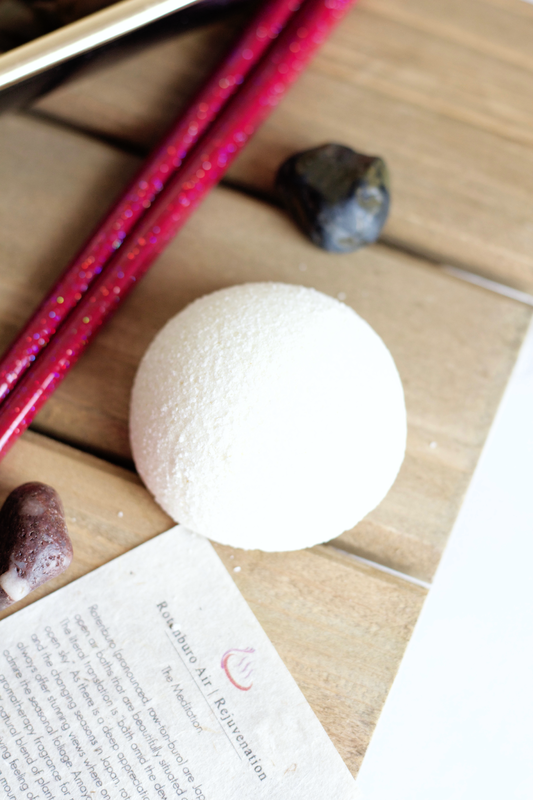 Amayori Rituals also caters to a busy lifestyle, as they have products available for showering, such as their Shower Mochi (simply set it about an inch away from direct water contact and you're good to go!). Even if you don't have the time available to soak in a bath for 15-30 minutes, allowing smaller amounts of time is so very helpful too. These rituals are not only addressing physical concerns but also inner and deeper ones within ourselves, essentially promoting tranquility as vital fragrant escapes from daily life. Fragrances provide that escape by their mood changing and stimulating physiological influence. Francoise recently came out with a new line named Rotenburo Air, taking inspiration from open-air Onsens (aka Rotenburo/露天風呂) that provide a stunning view of Japan's outdoors. It is an aromatherapy fragrance that is light and airy, providing rejuvenation and relaxation with ingredients like yuzu citrus (to relax and positive uplifting), orange (to replenish and revive), organic white pine and organic balsam fir (to refresh and revitalize), monarda flower (to relieve stress and promote positivity), and Oman white frankincense (to reduce tension). This lush aromatherapy blend transports you to a whole new scenery. This is honestly one of my favorite fragrances that Francoise has ever made. This fragrance reminds me of the time I was in Arashiyama, a district in Kyoto, as it has the most beautiful Autumnal scenery. Today I'll be talking about her Rotenburo Air Hikaru Multi-Use Oil*, Rotenburo Air Shower Mochi*, and Rotenburo Air Luxury Bath Salts*. Amayori Rituals Hikaru Multi-Use Oil* adds a beautiful glow to the skin with ingredients like organic camellia oil and rice bran oil, both having anti-aging and skin clearing properties. Organic perilla seed oil and sea buckthorn oil provide a luxurious moisturizing benefit, as perilla oil has a very high content of omega-3 fatty acids and sea buckthron oil has one of the highest contents of beta-carotene and vitamins C and E. It also includes Rosemary O2 extract, a prized plant for its medicinal and therapeutic uses, which is high in antioxidant content and polyphenolic compounds (flavonoids). 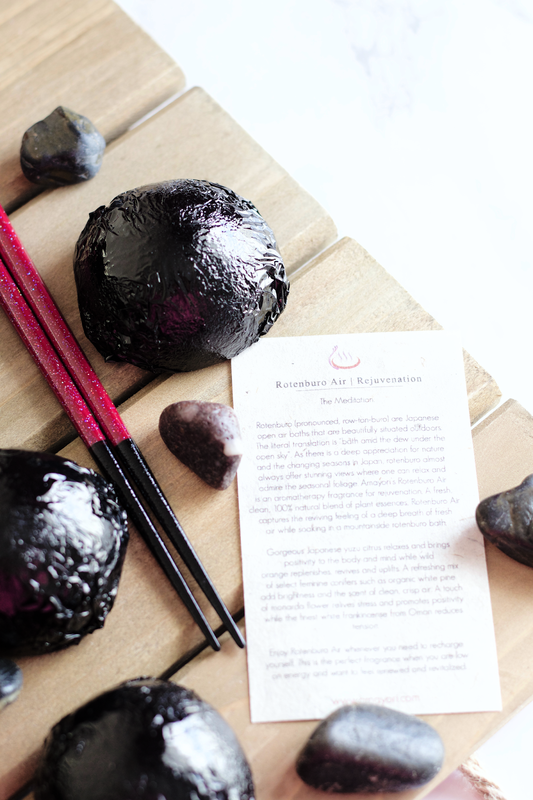 Along with the Rotenburo Air fragrance, which in itself is so gorgeous and full of such lush, tranquil ingredients. This product especially works to rejuvenate, revive, uplift, and replenish the mind, body, and soul. There are numerous ways that you can use this oil. You can use it after a shower/bath by placing a small amount in your palms and massage it into your skin, starting at the collar bone and making your way downwards. This is one of the most beautiful ways to apply it, just as your skin has been soaked in some warm water from your bath/shower and is needing some vital hydration from all the heat. I really love using it this way, as I find that I don't waste as much product and I get so much nourishment from a straight skin application. You can also apply pumps of the oil into bath water and soak in it, another great calming activity. It makes your skin look so radiant afterwards. It also can be used on damp hair and applied onto your skin before you take a shower. No matter what way you use this, you will fall in love with the experience and fragrance. I never used to use any body oils with my body care, I usually just hopped out of a shower/bath and that's that. I never thought that there could be more to cleansing the body, or rather that it could hold any real significance for me personally. This oil is not just beautiful in fragrance but also as a product that creates the perfect serene atmosphere. I wish I could explain in better terms but I honestly have no words for how beautiful this oil is. All I have to say is that I recommend you to try it, and a little goes a long way. Take a look at the ingredients yourself and I'm sure you'll fall in love with them as I have! You have not experienced the beauty of bath salts if you have not tried Rotenburo Air Luxury Bath Salts* from Amayori Rituals. These are one of the most gorgeous smelling bath salts. This is a rich mineral bath treatment that is composed of 100% natural ingredients sourced from all around the globe. They comprise a base of multiple skin softening salts, including salts from the Israeli Dead Sea and pink salt from the foothills of the Tibetan Himalayan mountains. Some others included are organic Atlantic sea kelp (promotes detoxification), green tea (nourishment and anti-aging benefits), and a multitude of natural and organic essential oils. 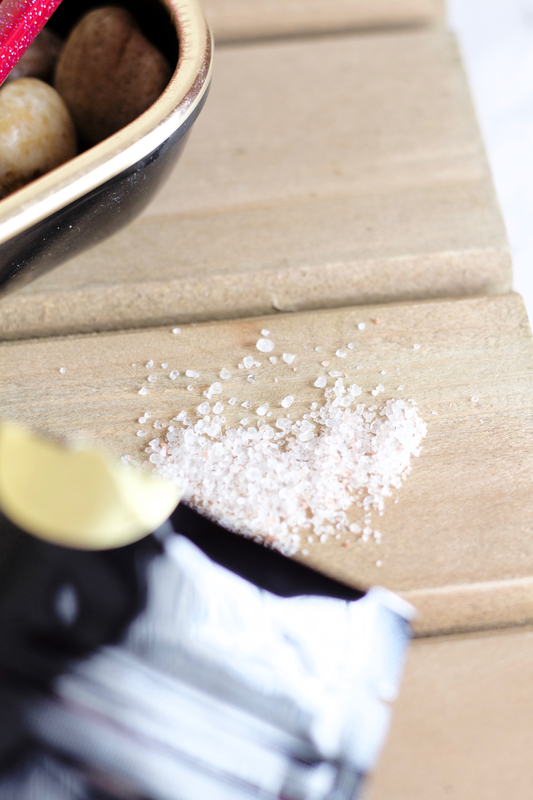 These bath salts allow yourself to reach an ultimate serene, calming atmosphere. The fragrance is very light and airy, which is so wonderful after a long day. Aromatherapy has been something I've very much been into these past months as anxiety and stress have been heavily impacting my daily life. Mixing bathing and aromatherapy together gives me the best way to release the heaviness I feel by taking the time to distance myself from reality. I find that I don't need to pour a full packet as there is so much of the product in a single one. I'm really sensitive to heavier scents so this has been perfect for me. I don't know if I have ever spoken about this before but I've been suffering from a lower back injury for now more than two years. It has really debilitated me and drastically turned my life upside down. Taking a bath or soaking in a hot tub has really helped to release the tension and extreme pain that I feel on a daily basis. Mixing this with aromatherapy has been so beneficial to both my physical and mental health. While soaking in a bath to help my physical injury, I've also been able to nurture both my mental and emotional health as well. I don't get to take baths very often but when I do, I really make sure I have enough time to use to get the most out of it. If you don't know what mochi is, it is a Japanese glutinous rice treat that's traditionally eaten for New Year's, as well as eaten all year round and for other celebrations. It's also specifically used as traditional decoration (鏡餅; kagami mochi). On my first trip to Japan, I was able to see up close how mochi was made as part of helping at a local festival in the countryside (this traditional act of making mochi is called mochitsuki; 餅つき). Francoise's play on using mochi as a bath product really intrigued me and I find it to be such a unique product in her line! It even uses mochiko (もち米粉), which is derived from mochigome (もち米) that's used to make mochi; it's a rice flour used as a thickener. This is an aromatherapy tablet that works with the steam of your shower. It's a great alternative for when you don't have time to enjoy a calming ritual in the bath. How you use this product is important, so be sure to not put it directly under running water as it will just waste it all. This is used with the steam of your shower, therefore it needs the steam to allow the fragrance to be fully released. You should place it about 1-1.5 inches away from direct water contact. It really works well with the steam and I often get to the point of not even wanting to come out of the shower because it smells so good! As this is a light scent, it is released through the steam as a subtle fragrance. I've gone through two shower mochi as of now and I find that I don't even need to fully use one up when I place it in the shower, I'll usually save the left over for next time. It is such a good size as well and easily can be accompanied with you if you happen to travel. I really recommend this for those who are often too busy to enjoy a bath. This and the Multi-Use Oil will be your best friends. Just this past week Francoise came out with a new line of products, called Kaori Sake Soak. Sake soaks in Japan are truly a unique experience, allowing you to bathe in rich amino acid acid content that deeply moisturizes and nourishes the skin. In Japan, there are places where you can bathe in all sorts of liquids, such as red wine, coffee, green tea, and so on. This sake soak includes aromatic hydrosols, organic camellia oil, green tea botanical extract, and multiple essential oils to give you the most heavenly experience. I've been using this whenever I can and it's now one of my most treasured products from the line. I hope that my review has helped you get a better sense of these beautiful products and Amayori Rituals as a whole. Be sure to follow them on instagram as they will alert you to specials that they offer, along with any giveaways. Plus, they post the most beautiful photos of their products and scenery pictures of Japan. 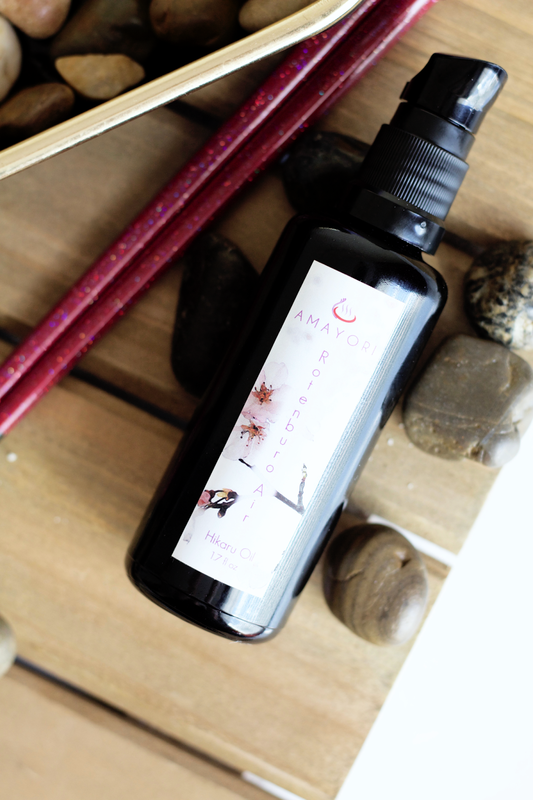 Let me know if you've ever tried Amayori Rituals before! If not, what would you like to try the most? *This product has kindly been PR gifted. All opinions are my own. See my disclaimer for more information. beauty blog dedicated to my obsession of all things makeup, skincare, and asian beauty. all photos and written work are mine except where noted, do not replicate anywhere else without my permission.